Good news: Recent research shows that reducing the carbohydrates in your diet may improve your egg quality. The results are encouraging and this approach may offer a new option for many women struggling to conceive. However, our long experience with nutrition shows us the issue is more complex than just “go low carb” or “go keto” for fertility! As you digest the following information, remember not all carbohydrates are created equal. We don’t have much information on the type of carbs the study participants were eating. Complex carbohydrates from whole grains (gluten free is best) and vegetables burn slowly in the body. They help keep your energy and mood high during your fertility program. Further, the overall composition of the diet, not just carb intake, is critical for reproductive health. A study with 120 women undergoing IVF by the Delaware Institute for Reproductive Medicine found that women with a lower carbohydrate intake (at least one-quarter of their diet was protein) had four times the success rates of those on standard diets. A 2015 study shows following a low carb/ high-fat diet improves cell mitochondrial energy. Mitochondrial energy is the fuel for normal cell and egg development. Low carb/ high-fat diets are now being researched for an illness where there is impaired glucose metabolism in the cells such as cancer, and also for fertility. Today, couples are being advised to follow a low carb/ high-fat diet for 2-3 months before egg retrieval as a way to promote healthier eggs and sperm at the Jacksonville Center for Reproductive Medicine. What’s The Deal with Carbohydrates and Fertility? The role of carbohydrates in fertility is very complex. We are only scratching the surface of the research. The major problem for the women we work with comes from eating refined carbohydrates (white flour, white rice, pasta, baked goods, cereals, white potatoes, etc.). Fertility problems are especially aggravated when refined carbohydrates are combined with simple sugars and processed foods (a favorite combo for many people). In addition, women who rely too heavily on carbohydrates from any source without adequate protein also frequently have hormonal imbalance or fertility concerns. A lack of protein in the diet increases stress, disrupts blood sugar levels, affects egg health and the menstrual cycle. Eating the right carbohydrates are important for your fertility! Here’s what we know about refined carbohydrates, simple sugars, and fertility. A diet high in refined carbohydrates, sugar and processed foods (i.e. a typical Western diet) prematurely ages the body and reproductive system by accelerating free radical production and inflammation. It also sets the stage for high androgen levels, obesity, hormonal imbalance issues, and a decline in egg and sperm quality. Refined carbohydrates and sugars imbalance immune response, exacerbating immune-related fertility problems as well. The Fertility Diet is high in antioxidants from fresh fruits and vegetables that directly support egg quality and reproductive longevity. It uses complex carbohydrates from whole food sources that most women tolerate well. We suggest avoiding and eliminating refined carbohydrates and simple sugars whenever possible while on a natural fertility program. 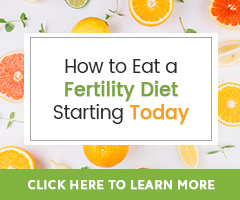 Finally, following a low carb diet could be a good short-term option for women with egg health concerns as they prepare for IVF or natural conception. Whatever your choice, be sure that you don’t end up with deficiencies in any key area, and choose only nutritious foods that encourage natural fertility.